By the time June arrives, I am ready for sunshine and heat! More and more I am reminded that June comes with a mix of rain showers and cool days. Maybe if I remember to 'dance in the rain' I won't mind the coolness so much. If you can't see the raindrops, click on the picture. We have had so much rain here I almost can't remember what the sun looks like! Day after day after day of rain... 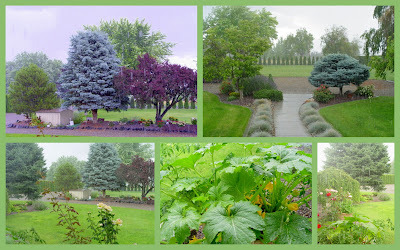 The trees, grass, and gardens are bright and green though =) Your "dance in the rain" suggestion is a good one! Oh I know the rain drops are there. We have been having them too. Love the quote. Thanks for the good advice. We've certainly had plenty of rain to dance in here in Illinois! Wet and cold last week, 98 degrees today! Keep dancing ~ no matter the weather! We really need rain in our area, so seeing the rain in your photos was encouraging. Beautiful pictures. Lovely yard and garden. And I loved your quote about learning to dance in the rain! We've had more than enough rain on the East Coast so it makes me nervous that it's all headed this direction. Hope that the sun shines soon for all of us! We had a summer time....a few weeks ago..then rain..now sunshine and cooler today...on our side of Washington...ANY day with SUNSHINE is a blessing..